I just opened my email to find this picture (above) of Jaliya and news that she is studying hard for next round for exams that are coming up very soon. This makes us immensely happy – and is giving me a great reason to share this little film we made with you today so you can see just how your support is changing the lives of children in Kampala. Please, please watch it. If it makes you feel half as proud as I do right now, it’ll make your day too. And when you’re done, please share it with everyone you know – through twitter, facebook, youtube – to spread the word about awamu and help us to change even more lives for the better. Jaliya is the inspiration behind awamu. You may recall that Jaliya suffered extreme neglect at the hands of her uncle when she was sent to live with him following the death of both of her parents from AIDS. She was just seven years old. Fearing she too had the illness and may “contaminate” his children, she was kept in isolation in a tiny hut, barely big enough for her to stand in. Little Jaliya slept alone each night on a sack and was forbidden to play with her cousins, go to school or even touch the family’s possessions. After hearing reports of a sick child, Regina – a member of the Tusitukirewamu Women’s Group – and our heroine, found Jaliya half-starved with a swollen tummy and coughing up blood. Regina pledged there and then to look after Jaliya, offer her the love and comfort she so desperately craved and nurse her back to health. Although she knew it would be a struggle, she found a place in her home for her alongside the 10 other children in her care who’d also lost their parents to AIDS related illnesses. Five years on, Jaliya is a healthy and happy 11-year-old. She’s doing well in school, she plays with her friends and brothers and sisters and, most importantly she has the love of a grandmother (or ‘ja-ja’) from Regina. A love that is so obviously reciprocated. And this is thanks to you and your support of awamu. 100% of your donations and proceeds from your purchases go to support orphaned children like Jaliya, in the slums of Kampala and the wonderful, selfless women that take them into their care. We help to train women in the communities in income generating schemes so they can earn a living to support themselves and their extended families. And we support networks of women who have been similarly affected by HIV who give their time and energy to helping the most vulnerable in their communities. They walk the street of the slums, seeking out children and adults in need of their support. They encourage them to confront their fears, navigate the medical system and offer care and protection to those who are too weak to look after themselves or their families. So thank you for every gift you have bought from us. for every share on facebook and twitter, every donation and, most importantly, every encouraging word you have given us. Sarah Namaganda shows you how to make her recycled paper beads…. There is a massive problem with rubbish in the slums of Bwaise and Makerer as the goverment privatised collection and families can’t afford to pay for it to be taken away. When there is heavy rain Bwaise and Makerer floods, rubbish gets washed into water channels that over flow and runs through peoples houses. The women’s groups we work with are trying to find creative ways to recycle what is around them. By buying these beads or any of our beautifully products you will be helping Sarah and the women we work with earn an income from there craft as well as helping them to change the lives of the most vulnerable children in their community me. Each of Sarah’s necklaces are individual and unique – please take a look. Sarah cares for 6 children (not 16 as she says in the video – lost in translation). Her own daughter and five adopted children including her niece Delphine. Though she supports many more orphaned children in the community. They live in small small hut made from corrugated iron and mud and with two people to a single bunk bead. All of the children she looks after are in school she told us “I make these beads so my children can go to school. Education is everything , my children must go to school so they can all have better lives than this“. Many thanks to Josie Gallo for editing my shoddy footage! It’s been a long day – lots of tutorials on new designs and products with Sarah and Florence. So I will spare you the words and just share a few photos from the day…. Sarah with Jackson, now a belting, lively little fella. Sitting on his mum’s lap whilst she still manages to sew! This is Frank, he is 9 months. He is the son of one of Sarah’s trainee tailors. Look at those big sad eyes! He refused to give his new awamu sun hat back after modeling it for us…but did offer loads of cuddles as well as smearings of biscuit and weeing on me. This is also Sarah, she is guardian of two of the children we are supporting through school. She was showing how she makes her recycled paper beads. This is Jackson again – finally smiling whilst kindly agreeing to model a new design of dress we are working on! Today was the first day I got to catch up with my friends at MAWDA and TWG (the two women’s groups we work with). I was greeted with the compliment ‘Wow, you have grown fat’ (this really is a compliment! )…which was nicely counter balanced with ‘But you look so young’. Thanks ladies! Most of our morning was taken up planning our skills training project but then I went to Bwaise to catch up with Regina, Rukia and Robina. Things have changed a little around this part of Bwaise – the government finally seem to be taking some action to stop the flooding that occurs several times a year with heavy rains and the drainage system can’t handle it. There are little pockets of green popping up all around the community. This is an ‘urban tower garden’ funded by the Belgium govt. as part of a Kampala integrated environment management project. They’re pretty awesome – once built I am told that a ‘tower’ like this can produce enough food to supplement five families diets for up to three years! They are easy to look after requiring little watering or weeding – easily managed by even those that are frail. They cost around £84 pounds to build – the most expensive part is getting the delivery of nutrition rich soil. Only a few women were able to benefit from the pilot project though 12 other women have received training but don’t have the funds to buy the materials and seeds they need to start their garden…..could this be the start of another awamu project! Regina took me to meet Jaliya from school. Jaliya and Regina are the people that inspired us to set up awamu. 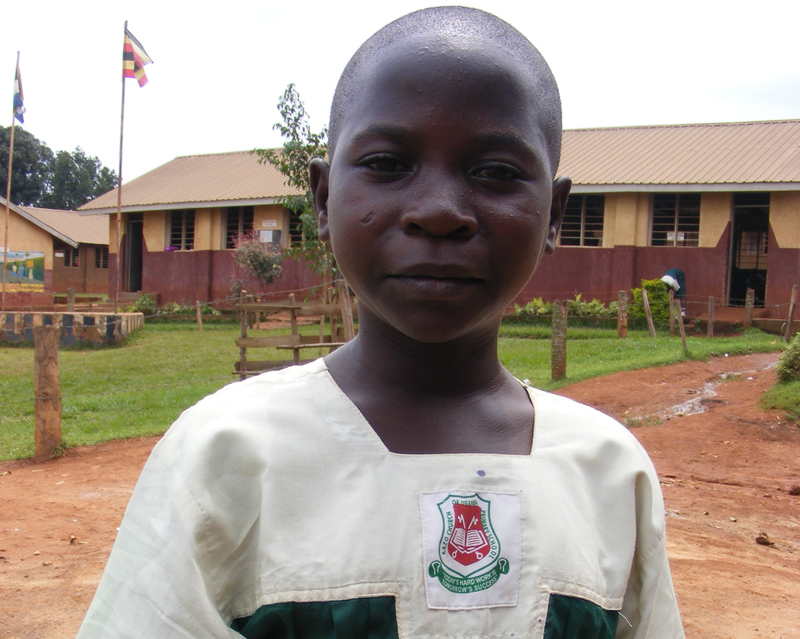 Jaliya is the first child we supported and now she is happily living with Regina and has just moved up to class P4. She is getting some of the best grades in her school – she came 2nd in class! We are incredibly proud of her hard work. Work has already started on our new products – good news for those that are waiting for elephants – they are almost ready to make their journey to the UK! I have put a few more pictures on our facebook page for you. To really understand the reality of life in the slums of Kampala and the amazing and inspiring people we are working with watch this film NOW! Florence, Regina, Jaliya and Emma show you what inspired us to start our litttle project in this short film. Awamu is dedicated to helping Regina, and her network of women, protect and care for children like Jaliya. As you will see their support means the difference between life and death for many in their community. If you would like to get involved by making a donation or have any bright ideas for helping us to raise more money we really want to hear – please get in touch! A special thank you to Ian Warren for finishing this before heading back to Uganda.